After reading Four Fish and seeing The End of the Line, I’ve thought a lot about sustainability and seafood. 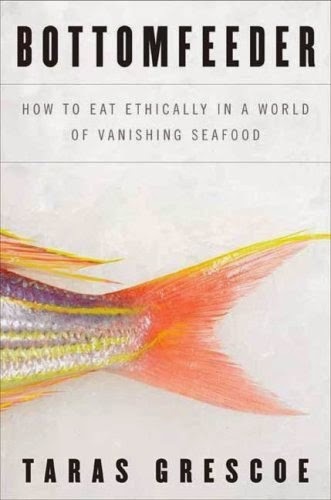 While I enjoyed that book and the documentary, neither one of them comes close to the quality and persuasiveness of Bottomfeeder: How to Eat Ethically in a World of Vanishing Seafood. The book is divided by regions and their seafood of choice – from monkfish on the plates of elite high-end restaurants in New York City to shrimp in India, bluefin tuna in Japan and the cod of England’s fish and chip shops and more. 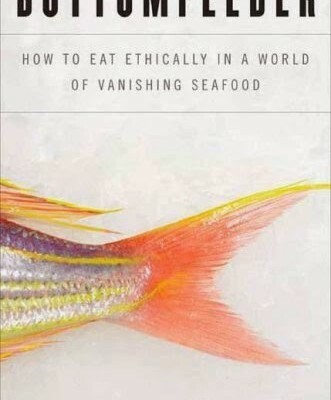 Throughout the book, Grescoe illuminates the issues that threaten that seafood population, but not in a heavy-handed way that makes sweeping judgements. His research is meticulous, and he makes clear that often it’s not one single event or practice that contributes to a population’s decline or collapse, but a convergence of different things. The book also covers the damage that overfishing has done on different levels. It’s not just the environment that is affected, but public health, the economy of traditional fishing communities and the ecosystem as a whole. Never before has eating lower on the food chain made more sense to me. And like encountering information about factory farming for the first time can make chicken nuggets hard to swallow, I’ll never look at imported shrimp or a piece of deep fried cod the same way again. There are just no compelling reasons besides convenience and cost to eat seafood that is taken from overfished, endangered populations. If we want future generations to enjoy eating from the sea, the time to start practicing restraint is now. Armed with this book as a resource and Seafood Watch from the Monterey Bay Aquarium, I feel confident about being able to make better seafood choices. We even stood in front of the seafood section at Costco this weekend, checking to see if any of the fresh offerings were ones we could buy without a guilty conscience. I want my choices to be healthy and sustainable – for both the ocean and human communities that fishing supports. 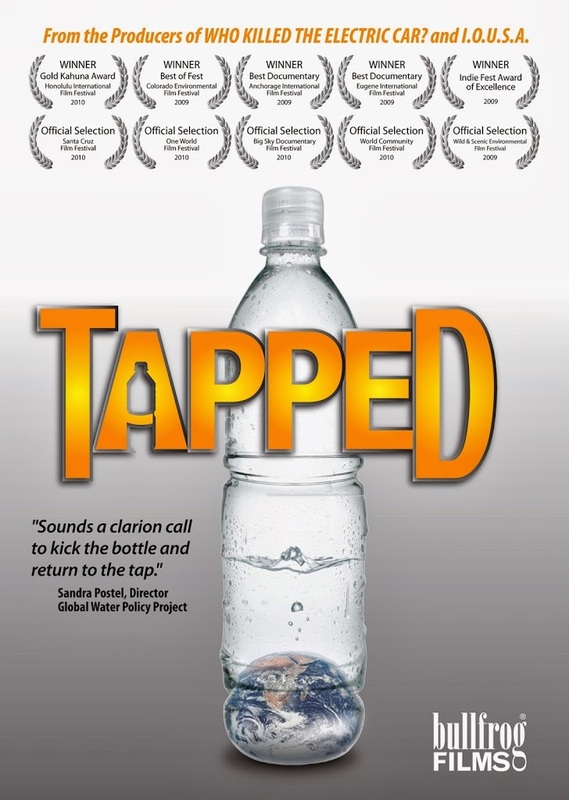 Tapped is a documentary that looks at how the bottled water industry affects our water supply and what we as consumers can do differently to help to preserve the integrity of our water supply. The film was made in 2007, so I’d venture to guess that some of the statistics have changed over the last 7 years, but much of what they discuss seems to still be true today. These communities often have companies pumping groundwater out of their land in the midst of horrible droughts, where their own sources dry up and people are placed on water restrictions. Efforts to fight companies doing that have been fruitless. There are no laws restricting what these companies can do to water supplies – they just show up and take it. Governments don’t want to fight these companies because they employee many people throughout the country, in not just the extraction process but the bottling process, etc. So they choose to avoid job consequences over environmental consequences and leave the community and the pubic hanging. This film does a good job of not just blaming the companies, but blaming us as consumers for buying into the ridiculous marketing hype surrounding bottled water. So many ads claim that their water is pure or comes from mountain springs (ever notice how many mountain graphics or the name ‘springs’ are on bottled water labels?). None of the water comes from mountain springs and some companies have been forced to put words like ‘public water source’ on their bottles. Because what you’re getting in that bottle? It’s tap water. Tap water that’s basically less regulated and less tested for quality than what comes out of your home’s tap through your municipality (if you don’t have your own well). While municipalities have to test their water multiple times daily, bottled water companies do their own tests at will, and aren’t required to do any of them. So when you see a label on a bottle of water that says “pure” – it’s no more pure than tap water and not filtered. 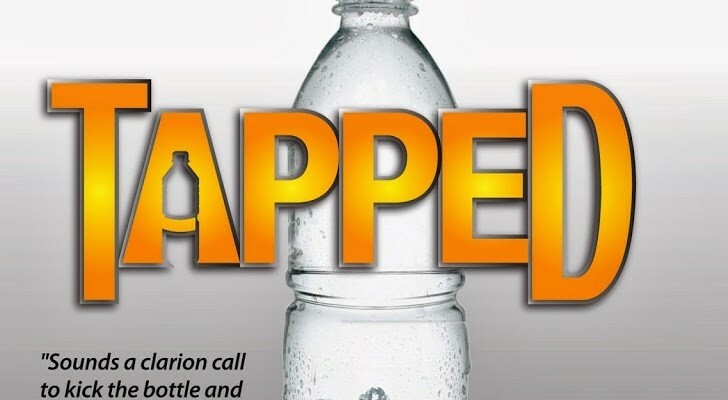 The film makes a pretty compelling argument for why if you’re environmentally conscious at all, you should be drinking tap water out of reusable bottles. (They encourage buying a water filter system of some kind – whether it’s on the tap or a pitcher, etc.) It also is beneficial for its explanation of what kind of water is actually in these bottles and how it’s no different than tap – I’m not a fan of hype and health washing in marketing, so it’s nice to have confirmed that the water coming out of my water filter at home is probably more pure than anything I could buy in a plastic bottle. I realized while watching the film that I already made this switch awhile ago. I use a Camelbak bottle that I love at work and at home – and I take it with me on the go to people’s houses and on vacations, etc. I have found many places that have water bottle fill stations that don’t cost anything. So while I do buy bottled water from time to time, it’s not nearly as frequent. I have no idea when the last time was that I bought a case of bottles. I’d like to keep it that way. I think most people who are smart phone users could argue that they have made our lives easier in many ways. I love having a grocery list that can sync up with my husband so we always know what we need at any given time. Same goes for a synced calendar. I like having a camera on the fly and having the ability to communicate with people in many different methods. GPS comes in handy constantly. But there are things I do on my phone that are meaningless, and sometimes I find myself doing them like a robot in a trance. I’m looking at you, mah jong games. I will sometimes even split my focus, playing a game or reading an article while also watching TV. Or worst of all, talking to someone in person while checking Instagram. So when I came across this program from UNICEF called the Tap Project which donates clean drinking water to children in exchange for 10 minutes without touching your phone, I was intrigued. Check out this quick video below. UNICEF is the United Nations Children’s Fund, and they work in many nations to provide access to clean drinking water and sanitation. We take for granted in this country that we have clean water – the most basic need that we have. I fill my water bottle at work and home countless times every day – it’s the primary beverage I drink. I take a shower with clean water every morning and wash dishes and clothes with clean water without thinking about it. In the last 24 years, UNICEF and its partners have helped 2 billion people get access to clean water. And their work continues. After 10 minutes, you’ve given a child a day’s worth of clean drinking water. While I did mine, a few facts popped up on the screen before it went dark and one of those were that 4 people were going without their phones at the same time in Pennsylvania. 4 people? That’s pathetic. We can do better than that. The next time you pick up your phone, think about how blessed you are to even have a phone to use. Think about how there are millions of people in the world today who don’t even know what a smart phone is because they are too busy trying to get clean water to drink. corporate involvement with kids: how much is too much? Two recent news stories have highlighted the issue of corporate involvement with children on environmental and nutritional subjects. These incidents included advertising as well as education, and I think they illustrate clearly the importance of corporate responsibility – something we clearly lack. I don’t think anyone can argue that it’s not important to teach science to kids – for them to understand what oil and gas are, how they are extracted, and what impacts they have on the economy and environment – both positive and negative. Science is awesome. And to be fair, the program did not educate children specifically about fracking, which is the most controversial issue in the oil and gas industry today (particularly in Ohio, where this program was based.) But is the best way to teach them to give an industry front group center stage and allow that presentation to be sponsored by Radio Disney? Why do children’s educational programs need to be “sponsored” at all? It’s a serious crisis if this nation needs to rely on corporate OR activist interests to educate its children. We need to give them facts and allow them to use their developing reasoning and analytical skills to draw conclusions. You know, like a scientist would. In the game, Usain Bolt (the Olympic champion sprinter) runs through a course where kids try to collect Gatorade, which makes him run faster, and avoid water, which slows him down. Ok, really? Even as a runner, I am not a fan of Gatorade for a multitude of reasons (read my post on it here). But the biggest issue is that there are few kids who are active enough that they even need to fuel with Gatorade or electrolyte replacements instead of water. Only kids who are heavily involved in sports and vigorous athletic activity even need to consider electrolyte replacement. For kids who just go to gym class? Water is fine. They don’t need the added sugar, and it’s flat out LYING to tell them that Gatorade improves athletic performance. What they should be doing is encouraging kids to get active. Advertising to kids is a slippery slope, since their reasoning skills are still developing and their ability to discern between reality and advertisements is spotty, at best. (I’ve talked about this before too.) Putting a famous athlete on a Gatorade ad makes kids think they should drink it too – but the likelihood of a kid working out like a pro athlete? Slim to none. Even though Pepsi Co. owns its own bottled water brand – Aquafina – they push Gatorade for athletic performance. Aquafina is supposedly even a partner with the First Lady’s Drink Up campaign, to try to get kids to drink more water. It’s ludicrous to even try to claim corporate responsibility for children’s health and then turn around and tell them water is the enemy of athletic performance. These two examples show how even programs with seemingly good intentions or benefits can have profit-driven corporate interests behind them. It’s important to understand where the messaging you are hearing is coming from and to discern facts from advertisements.